Ok..Here is the quick guide to configure wireless router as access point . You usually need to do this for creating a wireless network attaching to existing Ethernet home network without using additional access point. 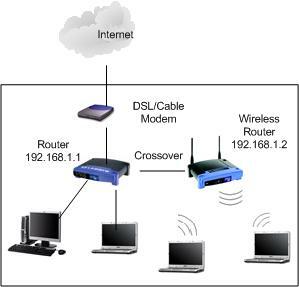 Here is how we make the network connection, just connect the wireless router’s LAN port to Ethernet router’s LAN port by using a crossover cable. If one of the router supports auto MDI/MDI-X feature, you can make the connection by using straight or crossover cable. This will create a hybrid network that comprises wired and wireless network. Don’t make any connection to wireless router’s WAN port; you won’t use it in this case. After that you can proceed to make router configuration. For the Ethernet router, you basically just keep the existing settings without changes. Assuming your Ethernet router's LAN IP is 192.168.1.1, and this will act as gateway for entire network (wired and wireless). If you would like to enable DHCP, then just enable the DHCP setting on Ethernet router and it will act as DHCP server for wired and wireless network (you don't need to enable DHCP on wireless router anymore). Let's take this scenerio as an example, you can enable DHCP with IP range 192.168.1.10-250, netmask 255.255.255.0, gateway 192.168.1.1, DNS servers 208.67.222.222 and 208.67.220.220. Ok… Now we are focusing on how to configure that wireless router as access point. Basically it’s pretty easy. There are only 2 configurations you need to do: LAN and wireless settings. First configuration is to configure the LAN setting on wireless router, means you need to assign an IP address and netmask to this router. In this case, I label it as 192.168.1.2 with netmask 255.255.255.0. After that, proceed to make wireless configuration by assigning the mode, SSID, wireless channel, SSID broadcast and other settings as according to your needs. Also you need to configure the wireless encryption to encrypt the wireless data and improve wireless network security. That’s the entire configuration; you can just ignore DHCP and other WAN related settings. It’s now the time for testing. The computer with DHCP enabled in wireless network will be assigned the IP and network information from Ethernet router. It will then able to ping the wireless/Ethernet router and access to Internet. Return to top of "Quick Guide to Configure Wireless Router as Access Point "